Indianapolis artist Anila Quayyum Agha earned top ArtPrize honors for "Intersections." rand Rapids was founded by early 19th-century European traders who lived alongside the indigenous Odowa Indians near the shores of Lake Michigan. It later became a Midwest rail crossroads. Growing up, my family knew it as “the city.” Only 45 miles south of my tiny hometown, it was where we went to shop and eat out. We’d bypass downtown and head for 28th Street, with its huge box shops and sprawling parking lots. Twenty-eighth Street was the Grand Rapids of my youth: Woodland Mall, Hudson’s, Schuler Books. Though I eventually ended up attending a downtown high school, the allure was always 28th Street. Downtown, I soon found out, had an entirely different feel. I’d park the car and walk, staring at the assortment of buildings and deciding that this was what a city should look like. Except that downtown was mostly deserted. There was a head shop called Purple East, that sold black-lit posters and Mexican sweaters (infused with the Nag Champa incense) that were popular in the 1990s. There was a coffee shop (closed long ago, name forgotten) where I’d practice my version of adulthood, which meant holding a novel and sipping on coffee (my version of adulthood). Every Thursday there was “Blues on the Mall” and downtown hosted an annual outdoor festival creatively called “Festival,” but there wasn’t much else. Change came slowly. In 1996, Van Andel Arena opened and started hosting local sports teams and concerts. Restaurants followed: the Sierra Room, the BOB, San Chez (before that, TGI Fridays was gourmet). A slow rejuvenation began. Two decades later trendy bars are all around. In 2012, the brewery-rich city co-won the “Beer City USA” title. Downtown also began branching out. In 2008, Grand Rapids became the host of ArtPrize, a global art competition whose winner is determined by a public vote. Funded by the DeVos family (of the Amway retail fortune)‚ ArtPrize is unique because anyone can enter and there’s no sitting jury for the top prize (though there’s a separate competition judged by professionals). Works are on display in an area that covers much of downtown and includes shops and churches, with larger installations going up along the Grand River. This year, there were more than 1,500 entries in 174 city locations. My latest visit to Grand Rapids coincided with the final week of ArtPrize, so I decided to take a look. I met my mother at her Heritage Hill home and we walked toward the First Park Congregational church. What struck me first was the number of people who were out and about. Pedestrians are the norm in European cities, but Michigan is a car empire. ArtPrize seems to have changed that: school groups, white-haired retirees, families and clusters of friends banded together to examine the art. I had to pinch myself. 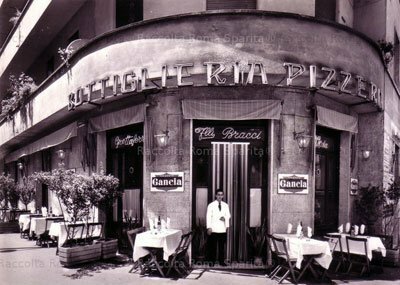 This wasn’t an Italian piazza but once-desolate downtown Grand Rapids. Inside First Park Congregational was Kim Froese’s eight-foot-tall “Face It,” a shiny totem pole lined with sculpted faces. Froese is from my small hometown of Howard City and she made the sculpture using colorful, textured paper gathered from Yellow Jacket and hornet nests. In the same room was “MacEgan Castle,” a six-foot-tall medieval castle that took Terryl Sperlich 21-years to complete. Its garden is modeled on one behind St. Mark’s in Venice. It also had an armory, a kitchen, and a church, with even tiny burlap potato sacks visible. ArtPrize seemed craft-oriented — Sperlich, for example, is a retired high school history and metal smith who also blows glass. After the church, we moved to the Amway Grand Hotel, the DeVos Center, the Ford Museum, the Women’s City Club; art was everywhere. We saw hyper-conceptual pieces, a black-and-white photo essay, plastic, metal, wood and paper sculptures, mosaics and paintings, even a cake in the shape of Michigan. In the online voting, hundreds of entries were whittled down to a top 20. 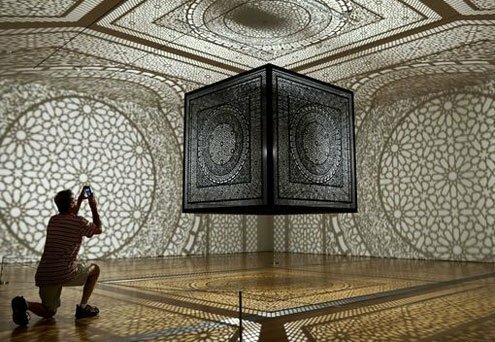 In the end, a piece called “Intersections,” by Indianapolis artist Anila Quayyum Agha — a shadow box made to project intricate, arabesque-like designs on the wall — earned top honors from both the public and the expert jury (and $300,000 in prize money). Above and beyond the art, what most impressed me was how the competition had charged up downtown. Doors were open; shops and restaurants flourished; people seemed cheerful and proud. ArtPrize is helping Grand Rapids integrate with the world in a tangible way. The Ripley’s Believe It or Not franchise purchased Froese’s “Face It” and will send it to their Amsterdam museum. Hers wasn’t the only piece set to travel. During ArtPrize, the immature Grand Rapids I knew as a teen came of age.